As a vegan, there is a good chance you’re tossing out a lot of vegetable scraps. Did you know that you can create your own nutrient rich compost soil for your plants and shrubs? How about for your container gardens or raised gardens. 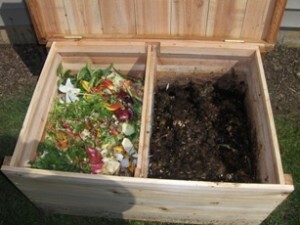 Even if you have a small back yard, composting takes very little room and it is easy to do. The purpose of a compost bin is to keep your compost pile neat, contained, warm and out of the wind. It also helps keep roaming animals like dogs or cats out. You can purchase a compost bin from most home hardware stores or garden centers. You can also build your own compost bin with just a little work. Place your compost bin where it will get partial sun and can be easily accessed for watering. You do not want your compost to dry out. Place a stack of sticks or twigs at the bottom of your compost bin. This stops materials from falling out and allows air to circulate in to and around the bottom of the pile. Fill your compost with a 4 to 6 inch layer of plant material, such as dry leaves or grass. Lawn clippings are excellent. Next, add a layer of fertilizer or manure to provide nitrogen. Keep layering your plant materials and grass clippings, finishing off with a layer of soil. Water the compost pile until very wet. Remember, you do not want your compost pile to dry out. At first your compost will seem to repel water, but once the vegetation starts to break down it will soak up the moisture easily. Within a few days your compost pile will begin to warm up, eventually getting fairly hot. Make sure you turn your compost pile over, either with a rake or shovel, at least every two weeks. Stir it in from the sides in to the center area where it is the warmest. If you have a compost bin that rotates itself or one that can be rolled around your yard, this will mix your compost for you. After mixing your compost, remember to water it. In about 2-4 months, depending on the weather and the quality of your clippings and plant materials, you should have a good rich compost to use in your garden. Compost is ready to use when it is crumbly, uniformly dark, and smells like rich soil. What About Composting in Winter? Yes, you can compost in the winter. Compost will continue to work and break down throughout the winter seasons. Is Veganism good for children?